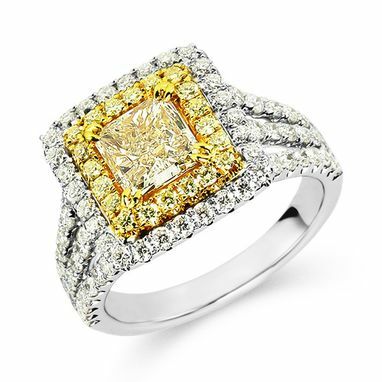 Bold and colorful are the best words to describe this yellow diamond engagement ring. The center diamond is a princess cut weighing 1.01ct and is accented by 1.20ct twt round diamonds. The double halo embellishes the center stone to truly bring out the vibrant yellow color. Be sure to watch the video to see the dazzling diamonds at work. Give us a call today to discuss this ring or visit our showroom on Transit Rd. in Williamsville. Please remember that Andrews Jewelers is a custom jewelry maker and we can custom design and create anything you're dreaming of. What Makes a Diamond Yellow? Colored diamonds contain interstitial impurities or structural defects that cause the coloration. In yellow diamonds, large amounts of nitrogen atoms cause the yellow or brownish tint to come out. 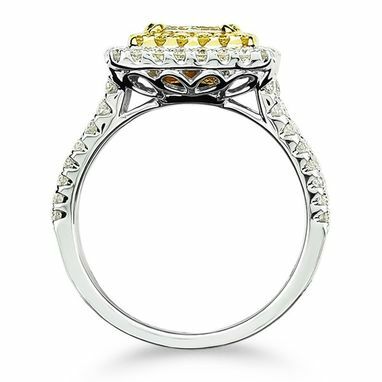 Yellow diamonds are found naturally and can also be artificially enhanced. Natural colored diamonds are more rare and valuable while enhanced diamonds are more common and less valuable.